It was another wonderful day for the kayakers as they were cruising through the forest. Yet they certainly did not expect to discover a ghost ship that was over a century old. 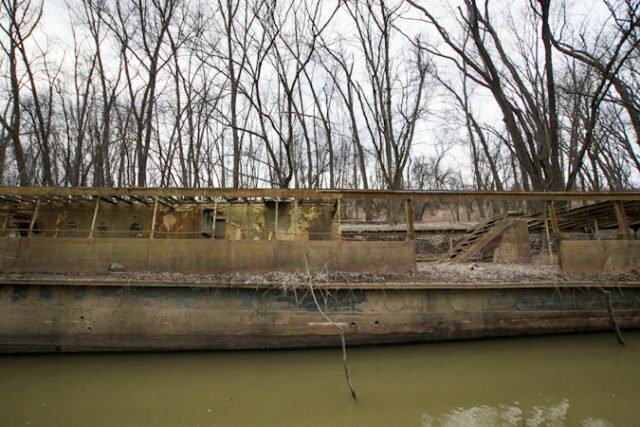 Shockingly, as they cruised along the Ohio River, they discovered the amazing sight of an abandoned vessel. Even though the pictures themselves were really neat, they did a little bit more research about the ship. It turned out that they had found a ship with a proud history within the United States of America. The ship was initially crafted by a Delaware ship maker named Pusey and Jones. The ship manufacturer was started by Mr. Joshua Pusey and his partner John Jones in the city of Wilmington. 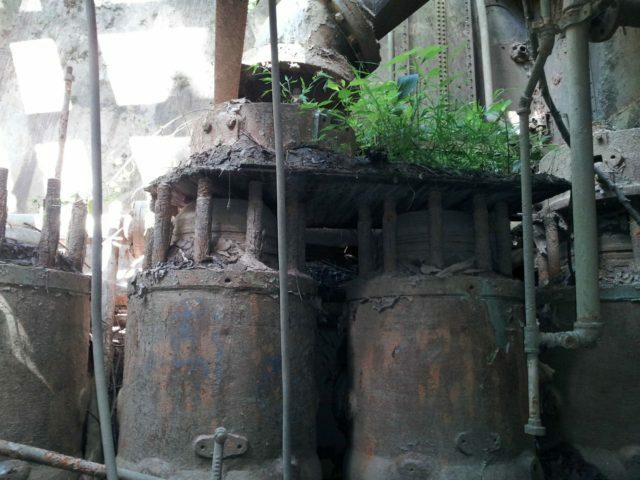 They rented an area from a whaling company that was positioned through the Pennsylvania Railroad. In the year 1851, the company bought an interest then changed its name to Betts, Pusey, Jones & Seal. Three years later, their bet paid off, and they constructed the first iron-hulled sail boat in the United States. The company built a vessel that took the crown at America’s Cup. It was the first steel yacht to ever take home the crown. In 1887, the company built the first steel-hulled yacht to win the America’s Cup, Volunteer. Naturally, the company caught the attention of the of man name J. Maxwell. He was a railroad executive of the same Pennsylvania Railroad that Pusey and Jones were positioned next to. And although he was a businessman, one of his true passions was yachting. Maxwell won the 1907 King’s Cup with his ship Queen in a race against Commodore Vanderbilt. The ship was initially constructed two years into the 20th century and was created as a yacht for J. Maxwell who was a renowned railroad executive. It first set sail in the second week of April in the year 1902 where it stayed faithful until its first change of ownership. Just before World War 1, the Celt was bought by a gentleman named Manton B. Metcalf and was happily used under the new name of Sachem. But when the war broke out in 1914, Germany’s key strategy to defeat the British was to be able to stop the resources from North America from being delivered to the British Empire. Germany was trying to starve and collapse Britain’s economy. Germany caught wind of the United States entering the war and they embarked on a mission to cut off supplies between the two Allies. Germany believed they had the advantage because of their famous submarines, named the U-Boats. Germany patrolled the Atlantic trying to send any shipment headed towards Britain to the bottom of the ocean. This was the first time that submarines played a pivotal role in warfare. U-boats were an incredibly effective tool. They were almost impossible to spot and they could strike any boat without warning. During World War One, the submarines were practically impossible to counter. In order to combat this disadvantage, the Navy started to rent well-crafted boats from the country’s wealthy elite. The goal was to use the quick ships to outclass the submarines by spotting and outmaneuvering the enemy’s submarines. The 186-foot yacht that was now owned by Mr. Metcalf was the perfect fit. As the United States entered the war in April of the year 1917, they began searching for vessels that could help them. The yacht Sachem was found and then acquired by the Navy in July and was converted into a Navy vessel within a month. The ship kept its name and was called SP 192 or the USS Sachem. The ship was equipped with charges that were used to sink the submarines as well as machine guns to respond to the threat of torpedoes. It turned out to be a very effective strategy. The USS Sachem was used to patrol the coastline of the United States. And while the President of the United States, Woodrow Wilson, dubbed World War One as the “The war to end wars,” the US chose to heavily invest in learning about the U-boats throughout the war to ensure they created a proper counter-attack in the case of future wars. And for this experiment, they used the USS Sachem to conduct research through none other than Thomas Edison. Edison is known as one of the greatest inventors and businessmen in history. Even though Edison invented the light bulb and pushed the electric grid into existence, he was trusted by the US government to help combat the United State’s biggest disadvantage at sea. Edison looked like the perfect fit to find a successful strategy to combat and sink the dangerous U-Boats. While it’s a controversial claim, the use of the boat was tracked down through a series of letters to Edison’s wife and by the tracking of the USS Sachem during the time of Edison’s experiments. First, Edison conducted tests around the New York Harbor before he ultimately sailed it across to Florida and off the Caribbean. But after he devoted his time to research, Edison and the Navy developed some friction. Edison published an article in 1923 accusing the US Navy “pigeon-holing” every solution he brought to the table. At the end of the war in 1918, Edison, the US Navy, and the USS Sachem went their separate ways. Sachem proudly completed the war and was returned to its rightful owner. The New York businessman, Manton B. Metcalf, of New York got his yacht back on February 10, 1919. After Manton had received his boat, he kept it for a time before he chose to sell it off to a banker named Roland Taylor who was from the city of Philadelphia. During the Great Depression, the boat then was pawned off to Jake Martin who used the yacht as a fishing vessel in 1932. Four families would work together to create a small $2 investment to catch some fish. After a decade of action in the fishing industry, the war was once again coming to the United States. The Navy again purchased the fishing yacht for $65,000 early in 1942. It was converted back into a war machine by Robert Jacobs Inc then was renamed the USS Phenakite or PYc-25. On the first day of July in 1942, the vessel patrolled the coastline around the Florida. After effectively protecting and combating U-boats, the vessel was quickly decommissioned so it could receive upgrades. The ship was back into action by November of 1944. The historic yacht was then used to conduct experiments and testing for new sonar technology for another year before it was sent into retirement by the US Navy in October of 1945. A month later, the ship was given to Maritime Commission to disassemble the warship. The yacht was then returned to its owner Mr. Martin. He then chose to rename it as Sachem just before the end of 1945. He resold the boat to Circle Line. The Sachem became the flagship tour boat for the Circle Line in New York City. The yacht could hold 500 tourists as the ship elegantly showed the passengers the proud history and beauty of New York. It served faithfully for decades before it was retired from the tourism industry in 1983. Three years later, the boat was purchased by Robert Miller, a man from Ohio. He offered a small investment of $7,500. 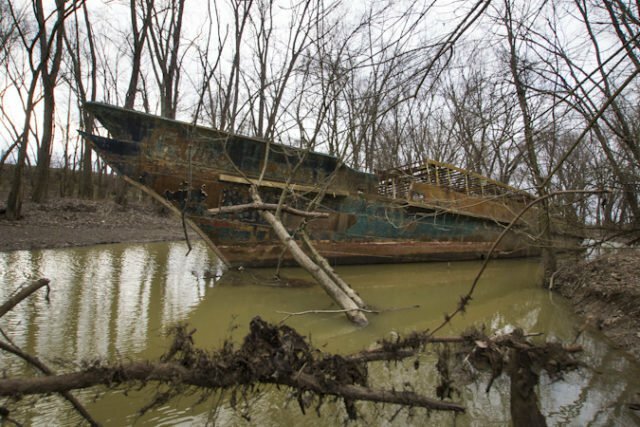 After the owner happily accepted the money, Mr. Miller pulled the boat out of the muck it was thrown into and repaired the boat over the course of ten days. One day, while he was working on the ship, a limo cruised up to Mr. Miller. He came asking if Madonna could use the newly remodeled ship. It was at this point, that the old Yacht entered the show business. It was showcased in the music video for the song “Papa Don’t Preach”. After the boat was restored, Miller cruised around the region to avoid pricey docking fees. He even used the Sachem on Independence Day in the year 1986 as Ronald Reason relit the Statue of Liberty’s torch. Mr. Miller attended the celebration that was filled with music and fireworks. Shortly after Independence Day, Miller chose to take his vessel home he bought outside of Northern Kentucky. The land was located just outside of Cincinnati Ohio. 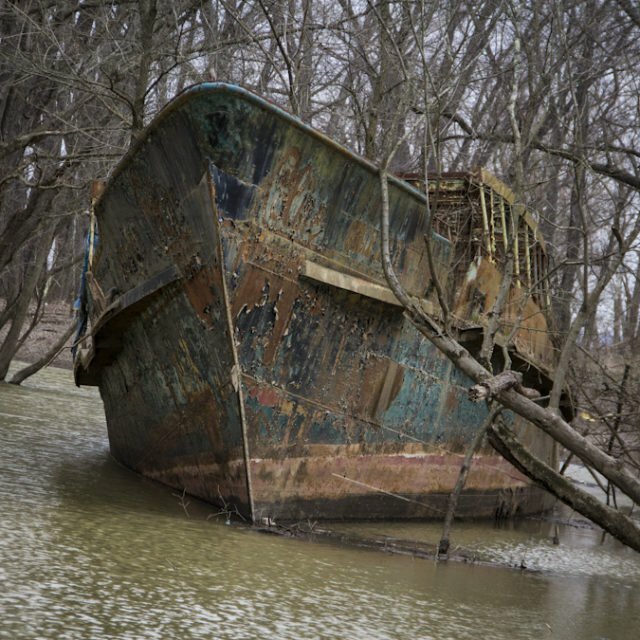 This last journey would end the colorful history of the yacht. 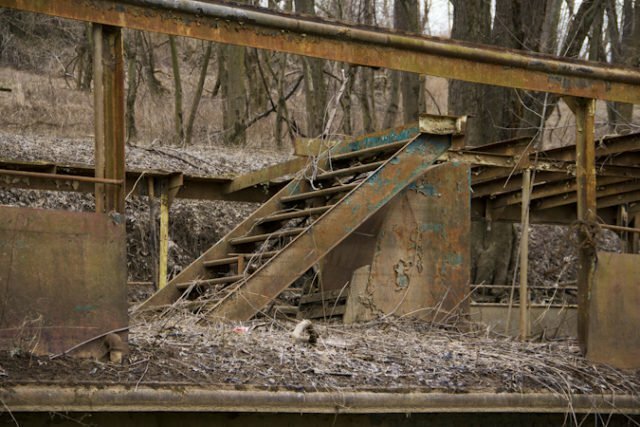 Today, it still sits 25 miles from Cincinnati, where the river casually flows to meet the Mississippi River. 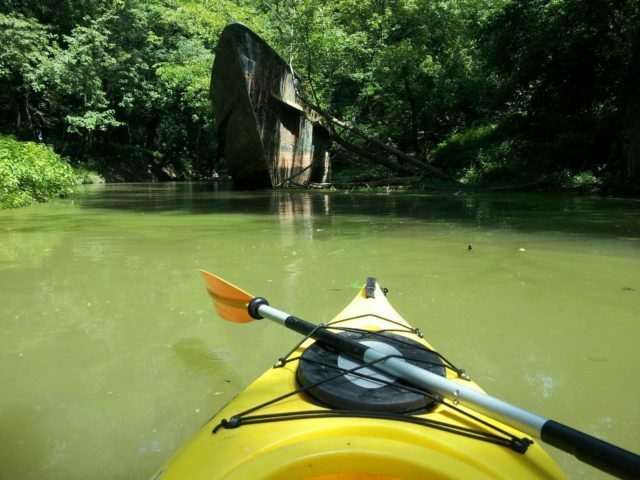 The next time you’re in Cincinnati, feel free to rent a kayak and check out the vessel that was once commanded by Thomas Edison. We live in a beautiful world, get out there and enjoy it.